This whole area of Broadstone, near Gateside village was once a thriving lime quarrying region. The name Reek Street , reek being Scots for smoke, evokes this time in the past where the kilns would have been burning lime day and night and creating plumes of smoke. 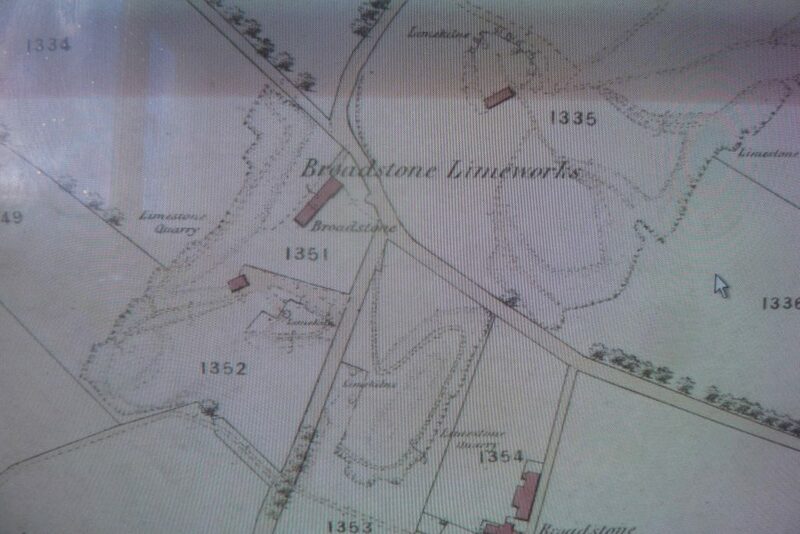 Broadstone quarries on the 1856 OS map. As part of the agricultural improvements instigated by the Earls of Eglinton, from 1780, the Ayrshire farmers started improving their soils with lime more intensively. The local soils around Beith tended to be fairly heavy clay with an acid pH and were more suited to grazing than arable use. Application of lime corrected the soil acidity and enhanced soil quality by allowing more air into the soil. This improved the soil structure for the benefit of the soil bacteria and thereby the roots of the plants. Lime could also be used for disinfection in animal husbandry, preventing the outbreak of diseases. These early kilns burned limestone mainly for agricultural use. Between 1850 and 1870, more lime was transported by mineral railway for use in the Glengarnock Iron and Steel works. 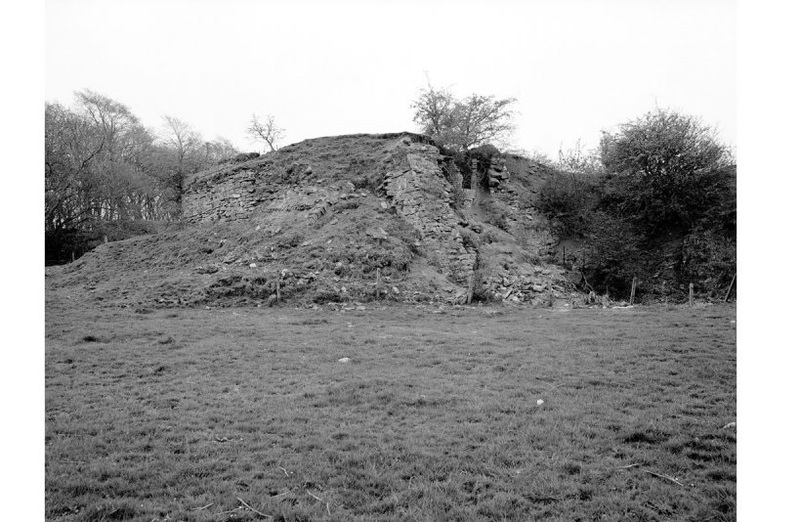 Broadstone has the substantial remains of one of the largest of the early stone built kilns and. 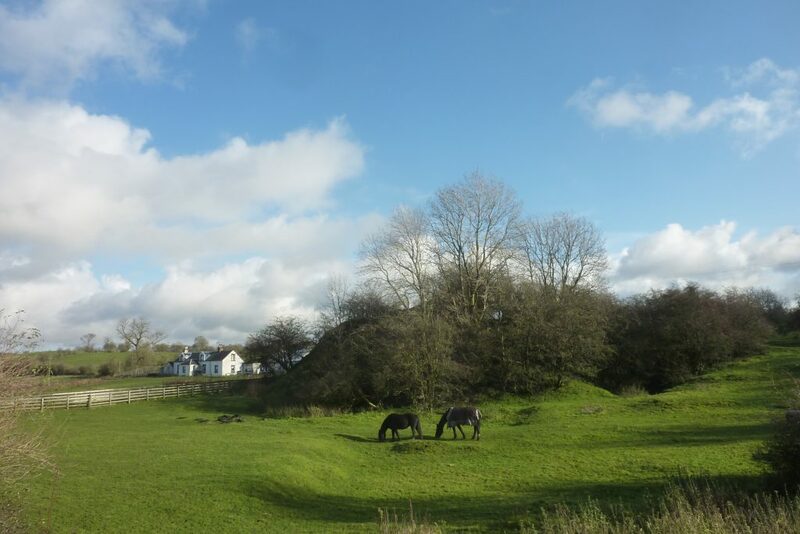 Before you come to the quarry itself there is a bank of four large kilns, now only the earthworks remaining, on the left field just by Broadstone farm cottage. At the top of the hill veer right and the old stone-built double kiln is in the woods to the left. You can also see the loading ramp to the top of the kiln clearly outlined in drystone blocks. The kiln ‘pot’ or opening where the lime was loaded in can also be seen. There is yet another more ruinous kiln directly across, on the other side of the road, now overgrown with trees and incomplete. These Broadstone Quarries were worked out before 1895. 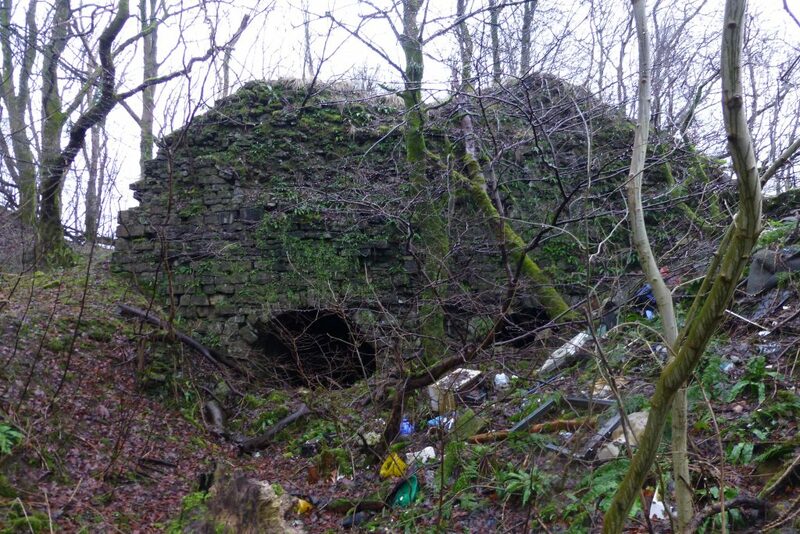 On 13 October 1828, the Glasgow Herald reported a fatal accident at the kiln, when on the stormy night of 4 October, Mr John Holmes, the lime merchant had went to examine the kilns to ascertain if they were still burning. Either due to the darkness or violence of the storm, he had stumbled and fell over the breast of the kiln and was killed. The limestone in this parish in inexhaustible: besides the great quantities annually burnt by the farmers upon their own lands, for manure, there are 2 public lime-works, which have a regular and extensive sale. Several beds of stone marle have been found lately, and many rich veins of iron stone. The Broadstone Kilns were operated by the firm of Robert Craig (1822 – 1901), following in the footsteps of both his father and grandfather. He was also a keen local geologist who published many papers. Many important marine fossils, including early sharks were found in these quarries and preserved. These fossil collections are in the Hunterian Museum in Glasgow University.